Former presidents Bill Clinton and George H. W. Bush saw each other on Sunday, and spent at least a portion of their visit talking about a relatively mundane clothing item -- socks. Clinton tweeted out a fun image of the pair on Sunday, revealing in the caption topics of conversation between the 41st and 43rd American presidents. "Great to spend time with @GeorgeHWBush & Mrs. Bush in Houston today," Clinton's tweet read. "We caught up about kids, grandkids, old times and new times. And socks." 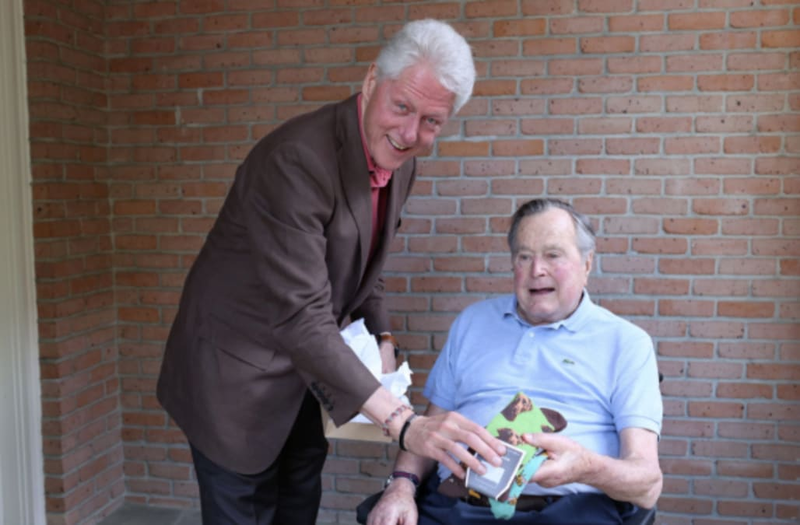 A pair of socks can be seen in the image, indicating that Clinton has gifted his presidential friend another pair of socks -- an item Bush historically appreciates and has collected in recent years. Bush 41 has developed a fancy for fun socks throughout the years, and expressed in a 2013 note a point of contention between he and his wife over his sock obsession. "I absolutely love a crazy pair of socks," Bush's note read. "Barbara, on the other hand, has had enough." Whether the former first lady will allow another pair of socks to enter her home remains to be seen. Washington, DC. 1-20-1989 After being sworn in as the 41th President of the United States of America by Chief Justice of the United States William Hubbs Rehnquist, President Bush delivers his Inaugural adress to the Nation. Pres-elect Bush getting his tonsils checked by grandchild Ellie LeBlond, w. Barbara (L) & Marilyn Quayle (R), at inaugural fete at Lincoln Mem- orial. Pres. George H. W. Bush and Barbara Bush waving, marching in inaugural parade, w. secret servicemen in tow. Former U.S. President Ronald Reagan greets newly-inaugurated President George H.W. Bush as first lady Barbara Bush and Marilyn Quayle (far left) applaud during Bush's swearing-in ceremony, January 20, 1989, in Washington, DC. President George H. W. Bush and Barbara Bush standing by torch during his inaugural opening ceremony at Lincoln Memorial. Barbara Bush (2nd L) sits in front of her son George W. Bush (R) and grand daughters Jenna (3rd R) and Barbara at the Presidential Inauguration of George H.W. Bush. Pres. & Barbara Bush (R) & VP & Marilyn Quayle standing, waving, during inaugural opening ceremony at Lincoln Memorial. Pres. & Barbara Bush (C) in stands, w. granddaughter Ellie LeBlond on Pres. 's lap & Marilyn Quayle (R), at Lincoln Memorial inaugural opening ceremony. Pres-elect George H. W. Bush (C) showing off his new inaugural limo license plate with his inaugural co-chairpersons Robert Holt (R) and Renne Percy Korth. Pres. George Bush & Barbara Bush (R) & VP Dan & Marilyn Quayle during inaugural opening ceremony at Lincoln Memorial. Pres. Bush being sworn-in by Chief Justice Rehnquist (R) w. Barbara Bush looking on, during inaugural. Secret service guarded presidential limo during Pres. Bush's inaugural parade. Pres. & signature pearls sporting Barbara Bush having high old time at TX-style black tie & boots inaugural ball. Pres. & signature pearls sporting Barbara Bush having high old time at TX-style black tie & boots inaugural ball, w. their son George (L-rear). Duck Dunn and Steve Cropper part of the Stax band play during the concert at the DC. convention center as part of President George H.W. Bush's inaugural festivies. This is the event where President Bush and Lee Atwater both took up guitars and played on stage with the band. President Ronald Reagan takes one last fond look back at the Oval Office at the White House January 20, 1989 as he leaves for the Capitol for the inauguration of President George H.W. Bush. Pres. & Barbara Bush turning to wave at their guests during inaugural ball. Beaming Pres. Bush (C) manning mike, w. admiring performers in bkgrd., at his black tie & boots TX-style inaugural ball. Pres. Bush reaching over, gesturing to unseen, w. wife Barbara (L) & secret servicemen, during his inaugural parade.